The migration of online direct-to-consumer brands offline has been a major retailing trend. Online eyeglass seller Warby Parker opening physical stores is just one of many examples. Now Facebook is helping “digital native” SMBs gain offline exposure with new pop-up stores within nine Macy’s locations across the US. Open through February 2019. The stores are located in The Market area of Macy’s in the following cities: New York, San Francisco, Seattle, Pittsburgh, Atlanta, Fort Lauderdale, San Antonio, Las Vegas and Los Angeles. The pop-up concept will operate through early February next year. According to Facebook’s blog post, 100 small business brands on Facebook and Instagram will be featured at these locations. Facebook is also running a campaign in Grand Central Station in New York to promote the brands that will appear in the Macy’s Herald Square pop-up location. The campaign will run for three weeks, which should benefit Macy’s as well as the SMB brands features. Facebook offered any brand on its platforms the opportunity to apply. 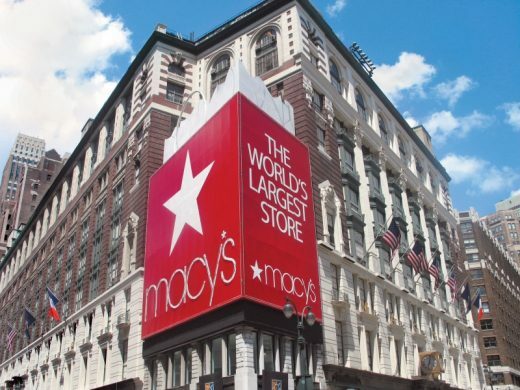 The company said that “Macy’s handled the selection process across a range of criteria, primarily around store capacity.” The 100 brands will be distributed across the nine Macy’s locations and will rotate over the course of three months. There will be roughly 15 brands in each store per month, according to a Facebook spokesperson. A few brands will appear in more than one location. Convenience, immediacy and avoiding shipping costs were other reasons cited for shopping locally. Other surveys show a strong consumer preference for offline shopping. Amazon, the ultimate online shopping destination, has moved aggressively offline with its purchase of Whole Foods, the opening of Amazon Bookstores in multiple cities, AmazonGo expansion and the opening of Amazon 4-Star stores. This all reflects the importance of an omni-channel strategy for both traditional and online retailers. E-commerce is a growing market, and multiple surveys continue to promote the notion that consumers will be shopping increasingly online. However, US government data continue to show e-commerce hovering just under 10 percent of total US retail spending, which is valued at more than $5 trillion. Why it matters to marketers. The companies that dominate e-commerce are Amazon and traditional retailers, with a small handful of online pure-plays holding their own. Facebook’s pop-up stores will give a sales and brand boost to these digital-native SMB retailers. Offline presence helps build awareness and credibility. The effort will also provide some temporary, additional “sizzle” to Macy’s stores. This move also shows the way in which the pop-up store concept is gaining broader adoption as a way to offer an offline presence for smaller retailers that can’t necessarily afford the logistical challenges and financial risks of full-time retail occupancy.